This report can be run from the cloud icon on the blue Toolbar for a person, a Tag, an Organization, a filtered list in an Organization, or for a search results in Search Builder. It is a one-page per person report that is designed to provide information you would need in order to make a Contact. It presents personal information in the Header, then a Family Summary, a list of Recent Attendances, any Contacts made to that person, and then a list of Current Enrollments. If the person has a lot of Contacts, the report may run to 2 pages. As you see in the image below, you have everything you need in order to make a Contact. 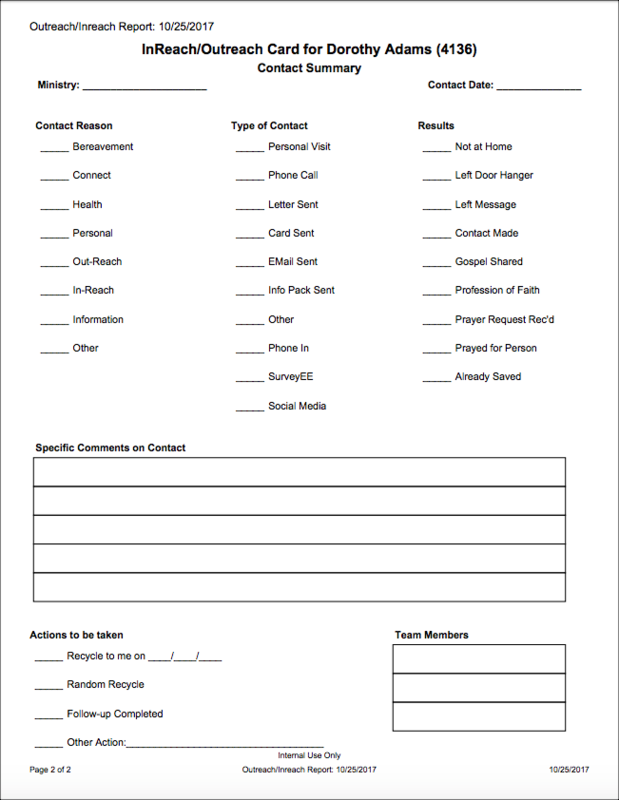 We have an option to print just the Inreach/Outreach report, or to print the Inreach/Outreach with Form. The form is an added page where you can record the results of your visit and then transfer that information into TouchPoint when you record the Contact. See below for a sample. Each section of the report is outlined below. The date printed will be in the top left corner, with the individual’s information across the top in the header section. This is really helpful if you are making a personal visit or even making a phone call to the home to know names and ages of others in the family. This is especially helpful if you are planning a Contact for a recent guest. You can see exactly when and what they have attended. This is a list of all Contacts made toward that person. This is a list of anything the person is currently enrolled in. We have an option for you to include specific Extra Values on this report. You can read about it in the document listed below. If you are printing forms to take with you on a visit, you may prefer the version that adds a 2nd page. Select Inreach/Outreach with Form. This form page has a place for you to make notes until you return to your computer and can log the Contact into TouchPoint. 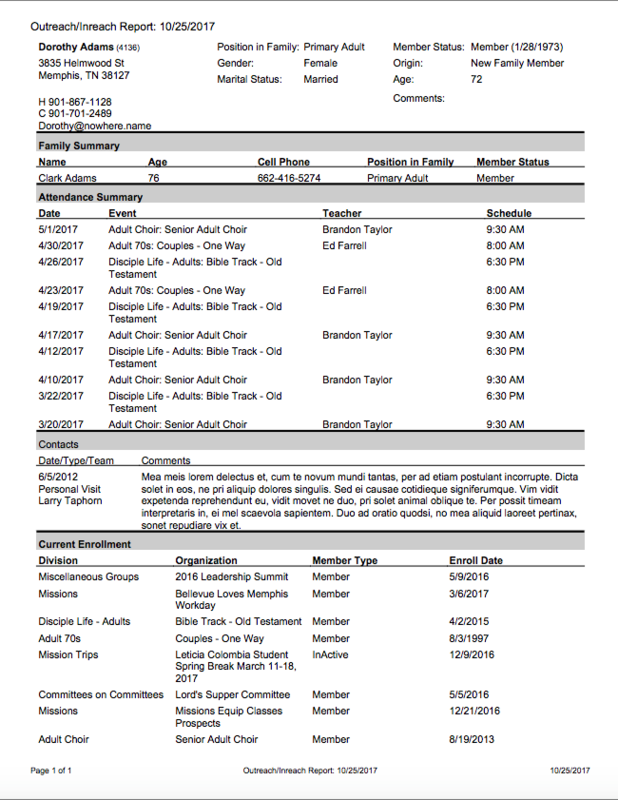 Notice that the top of the form page has the name and PID# of the person from the Inreach/Outreach report. That is helpful in case the first page is separated from the form.